It’s not fancy and its build quality reflects its $100 price tag, but it’ll get the job done. Smart thermostats have been dropping in price steadily as more players enter the market, so there’s really no reason to install a dumb model these days. But if you’re working with a tight budget, and don’t mind giving up some of the fancier features the top-shelf models offer, this one from iDevices works with all three of the major digital assistants—Alexa, Google Assistant, and Siri—and it can be integrated into Apple’s HomeKit ecosystem, too. It’s not the slickest or most feature-rich thermostat you’ll find, and doesn’t offer the highest build quality—heck, it doesn’t even have a trademarked name—but you can pick one up on Amazon for about $100. Outfitted with a tiny, 2-inch, color LED display inside a glossy white enclosure, iDevices assumes you’ll manage it with either voice commands via a smart speaker or with its mobile app. It can control one- and two-stage heating, heat pump, and cooling systems; and ventilation fans. If your HVAC system is any more complex than that, look elsewhere. iDevices has a handy online compatibility checker if you’re not sure. The wiring block illustrates the limited HVAC configurations this thermostat supports. There’s no touchscreen, and the unit itself has just four buttons: Options, up and down arrows for adjusting the temperature and selecting options, and a back button. Given those limitations, don’t expect to do much at the thermostat itself other than to adjust your desired target temperature. The thermostat’s enclosure feels cheap, and the wire connection terminals are particularly flimsy. The thermostat depends on the presence of the C-wire for power, and unlike most of the smart thermostats we’ve reviewed, iDevices charges an extra $19.95 for the conversation kit. And if you want to use Siri to adjust the remote from afar, you’ll also need to have an Apple TV on your network. The mobile app, on the other hand, is nicely streamlined and easy to use. The main screen displays the current and target temperature, lets you adjust the target temp on the fly, and reports other important data, including the current modes, humidity level, and schedule. To help with programming, the app asks you what time you wake up, go to bed, go to work, and get home, along with your preferred temperatures for each of those times. After that, it’s good to go. Geofencing isn't supported, but scheduling preheating and precooling periods might work if your schedule is predictable enough. If you need something more complex and/or personalized, the app makes it simple to create a schedule that sets temperature targets for times and days of the week. Unlike most of the competition, however, iDevices’ thermostat doesn’t support geofencing that will automatically adjust the thermostat based on your location. Instead, you can simply program an option to precool or preheat your home based on programmed events, such as when you anticipate returning home from work, so the temperature is at the desired target when you get there. To use this option, you select 15-minute intervals between 15- and 90 minutes. That’s not the most sophisticated comfort solution we’ve encountered, but it will work if your life follows a predictable schedule. 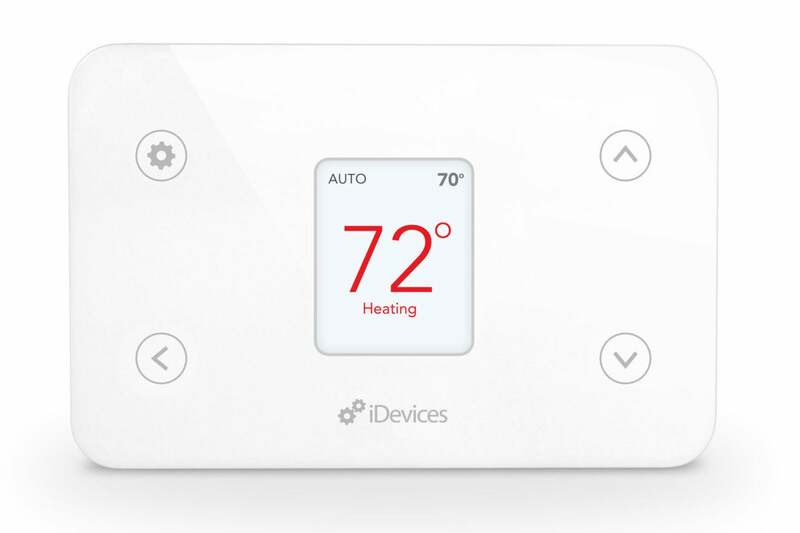 The iDevices Thermostat isn’t flashy, impressive, or particularly well built, but it is very inexpensive, easy to use, and it works as advertised. If your HVAC is relatively simple, and you like the idea of being able to adjust your thermostat at home, from the road, or with voice commands, it’s good enough.